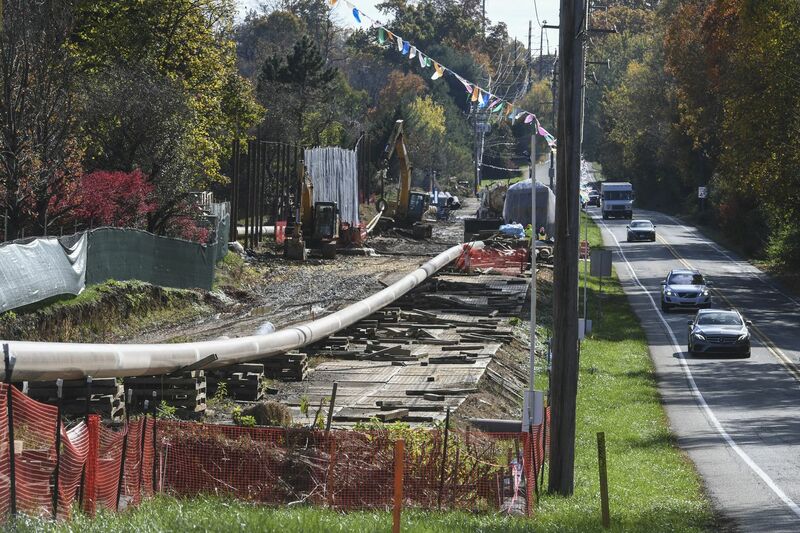 Sunoco's Mariner East pipeline being installed on North Chester Road in East Goshen Township, Chester County. A blizzard of emails, texts and other communications in early 2017 involving top aides to Gov. Wolf, his environmental protection chief and the CEO of the firm building the controversial Mariner East 2 pipeline that slices through Philadelphia’s western suburbs makes one thing clear: There was tremendous pressure to get those pipes in the ground. An investigative report published Monday by the Guardian newspaper reveals that a top aide in Wolf’s office texted Department of Environmental Protection chief Patrick McDonnell to hold off on a deficiency letter that would have found fault with some of Sunoco Logistics’ plans for the 300-plus-mile natural gas pipeline, and that ultimately construction permits were issued in February 2017 despite DEP staffers hoping to continue their review. To Guardian journalist Will Parrish and environmental foes of the pipeline project, the internal state communications — obtained through a variety of sources including right-to-know requests, an earlier report by State Impact PA, and a lawsuit by the Clean Air Council — show a government that was determined to make Mariner East 2 happen, even as two subsequent years of mishaps, spills and state fines have only confirmed opponents’ fears. Not surprisingly, Wolf administration officials offer a more benign explanation of the newly revealed communications. J.J. Abbott, the governor’s spokesman, told me that staying informed on the high-profile pipeline project was “normal and responsible governing,” that Wolf or his aides never directed DEP to issue any permit, and that the administration lacked legal power to either halt the project or re-route it away from schools or neighborhoods in the highly populated suburbs. Laid out pipes for the Mariner East natural gas pipeline by the Goshen Corporate Park in Chester County. But it’s clear, if numbingly unsurprising, that those who will profit from Mariner East — most notably then-Sunoco Logistics president Mike Hennigan, whom according to the Guardian report “regularly talked to McDonnell in the lead-up to the permit authorization” — had direct access to Pennsylvania government while the everyday citizens of Chester and Delaware counties getting a pipeline plopped down in their backyards did not. “It’s a window into the unfortunate reality that major players with a lot of money are often able to have access to officials and sway public policy in Pennsylvania in a way that the general public does not,” Alex Bomstein, attorney for the Philadelphia-based Clean Air Council — which has fought a so-far doomed battle to stop the pipeline — told me. Despite running on a moderately pro-environmental platform in winning the governor’s office in 2014 and re-election last November, Wolf has still accepted tens of thousands of dollars in campaign contributions from oil and gas interests, including $20,000 from the political-action committee of EQT Corp., which has a contract to ship fracked natural gas over Mariner East pipes. And the Pipeline Infrastructure Task Force that Wolf created in 2015 was 92 percent comprised of people with ties to the oil and gas industry. Wolf has proposed (and been thwarted consistently by GOP lawmakers) various severance taxes on oil-and-gas production to fund schools or infrastructure projects, but such taxes would be worthless unless the fossil-fuel spigot is kept open. Regarding Mariner East, the governor acknowledged to CBS Pittsburgh in early 2017 that he held DEP to a schedule — that “I asked them what their timetable was and then, let’s do it." Activists now say internal documents suggest environmental regulators were pressured to keep to that timetable, even if that meant shelving a letter citing Sunoco Logistics for inadequacies in some of its plans for moving earth and drilling under water to install Mariner East 2. Eric Friedman of the group Del-Chesco United for Pipeline Safety — which obtained some of the state documents cited by the Guardian — said the group has calendars showing McDonnell and top Wolf aide, Yesenia Bane, meeting with Sunoco executives exactly 60 days before the permits were granted on Feb. 15, 2017. His group has cited the involvement of Bane, who is married to a former oil-and-gas industry lobbyist, in a complaint to the Pennsylvania Ethics Commission. “Once they got that piece of paper in hand, they proceeded with reckless speed,” said Friedman, who said work crews were busy digging the new $2.5 billion pipeline (which mostly parallels a much older existing line, with a third pipeline envisioned soon) within just a day or two of the February 2017 decision. In the two years since, the Sunoco project — under parent company Energy Transfer Partners (ETP) , also behind the the controversial Dakota Access pipeline that sparked nationwide protests — has been fined more than $13 million by the state for improper work and blamed for a series of industrial waste spills, polluting homeowners’ wells and causing sinkholes. Work has been shut down twice — most recently after a different ETP pipeline in Beaver County exploded and caught fire. Activists like the Del-Chesco group and the Clean Air Council continue to press the state’s Public Utilities Commission — which originally approved the pipeline route in 2014 — to declare the pipeline in violation of safety regs, but so far to no avail. Sunoco/ETP has vigorously defended its work on the project. Much of the troubled construction work is now completed, and parts of the Mariner 2 system went online in December; action is already shifting to criminal probes launched by Republican district attorneys in Chester and Delaware county — both of whom are locked in tough re-election fights — and attorney general Josh Shapiro. The Wolf administration says it’s looking forward — toward legislation that would give the state greater control of pipeline siting issues that it didn’t have with Mariner East — and there are reports that Sunoco/ETP may shut down the 88-year-old Mariner East 1 with the new pipeline mostly here. But the new question about how Mariner East 2 got the construction go-ahead is one more argument for a radical but unlikely solution: Cancel the rest of the construction and shut the operating sections of the liquefied natural gas pipeline down. It sounds extreme, but as a journalist on Long Island in the 1980s I covered the Shoreham nuclear plant, which was completed at a cost of $6 billion but never opened — after Pennsylvania’s Three Mile Island made it clear that the heavily populated island could never be safely evacuated in a similar crisis. Similarly, the checkered safety record of Sunoco/ETP raises the same type of questions about the wisdom of running the pipeline so close to subdivisions, schools and ball fields. That’s on top of all the evidence since 2014′s pipeline approval that climate change is here and that Pennsylvania — which produces 1 percent of the world’s greenhouse-gas pollution — needs to start embracing radical measures. In a state where the pipeline for pipeline approval was way too wide open, we can only pray that many people will be proved wrong.